I love camping. I love being outdoors, living simply and sharing great experiences with fellow campers, whether they be old friends or friends yet to be made. This weekend, however, I had to endure one of the downsides to camping, because I spent my weekend drying out the wettest tent I have ever come across. It all started August Bank Holiday weekend, when I took my 7 year old godson camping with my friends and their grandchildren. We had a fantastic first two days in the Gower, a stunningly beautiful part of Wales that is less than 2 hours drive from my house. The sun was shining, the sea was clear and the kids had loads of fun playing on the beach and crabbing in the rock pools. Unfortunately, as so often happens in the UK, the weather took a drastic turn in the early hours of Monday morning and we woke to heavy rain. It wasn’t even a refreshing, summer rainfall. The sky was grey, and the water fell in huge drops, drenching everything it came into contact with. Including my tent. I packed the tent back into its bag as quickly as I could and shoved it in the car. When I got home, I left it balancing over the bath, where it slowly dripped water until this weekend. On Saturday morning I decided I had to bite the bullet. The weather forecast looked good, and we don’t know how many more nice weekends we’re going to get here in Wales this year. I couldn’t put it off any longer, I had to dry out the tent. It was horrible. I didn’t realise such a small piece of canvas could hold so much water. It literally poured out as soon as I opened the bag, and it pooled in every fold of the tent as I tried to lay it out in my back garden. Now, here came my next problem. My back garden, which I share with my downstairs neighbour, is smaller than my tent. So, I can’t just pitch the tent and leave it for a couple of hours. I have to dry it in sections, running down to my garden every hour to direct another part towards the sun, and all the time keeping an eye out for those ominous British clouds that could ruin all my efforts in seconds. 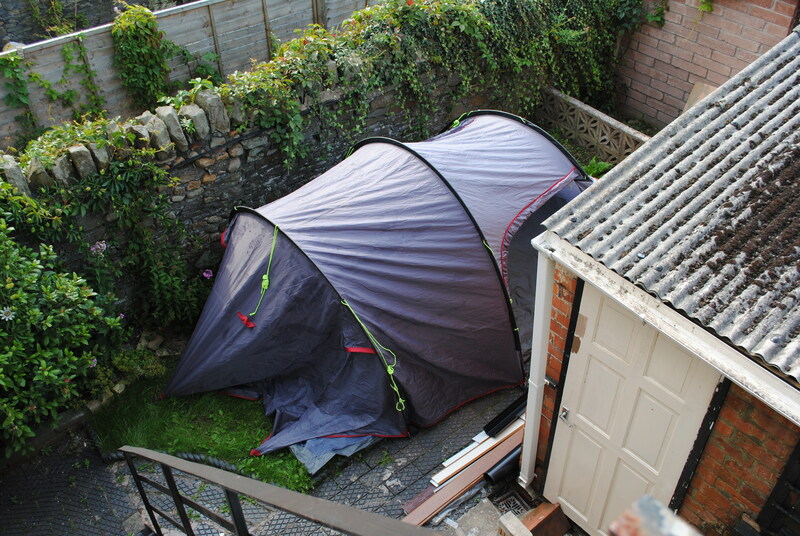 I’ve posted a picture to show how comical my tent looked in our tiny back garden. I’ve pitched tents in some tight places, but this was just ridiculous!